Update coming at 21:00 GMT. Enjoy! If one can say this for this update. The following tutorial is not from me, but when I found it I considered it as quite helpful as it shows the full workflow for one object. The only thing missing for a BF2/FH2 object is actually the export but that shouldn't be the problem. For about 2 weeks I've been working on my second undertaking which will showcast one of the most important beaches of the Omaha codenamed beachzone. My aim is to cover as many realistic details as possible while not all neglecting the fun of the gameplay. My sketch, the terrain and the general texturing... flag position etc. has been done but after some successfull alpha-testing I like to enrich the map to a level which will be ready for my second test. What I'm looking for are close-up details of the defense systems. I got several nice sources which have some statics in common. They are already positioned and form the core of the Widerstandsnest 62. While I know where I have to (and want for the gameplay) place barbewires and many obstacles as the famous watertrench (which costed me quite some nerves) I really want to know which object on the following picture are what type of object. Unfortunately I can not read the signs and I found the picture a dozen time... but it's never readable. 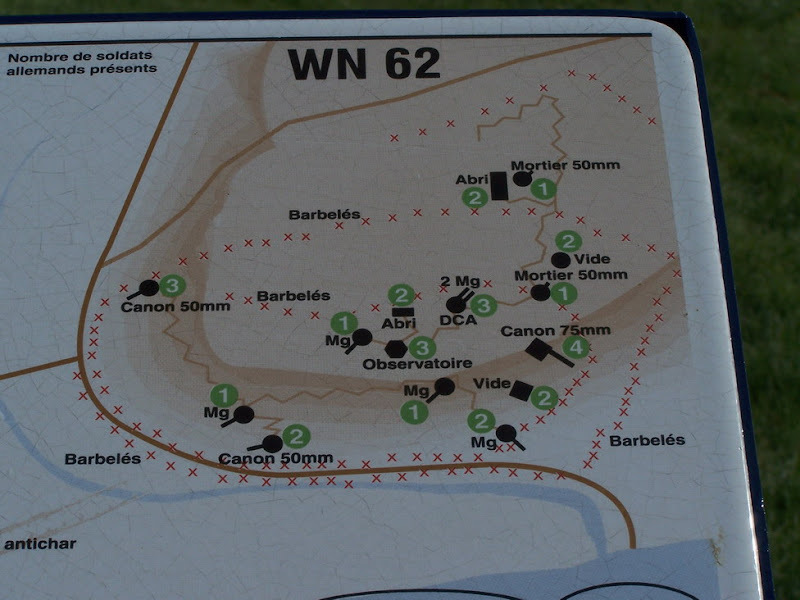 I hope someone can tell me what type of bunker, trench, weapon where on the corresponding numbers. This image seems to be the most reliable on I found. 1.) MG Position or simply Colleville sur Mer? 18.) Sandbag ( ) with MG34 or MG 42? The last one is my source for the terrain. But it's missing existing buildings and trenchlines... to sad. Hope you can help me with that problem so that I can fill the list up as good as possible. I don't have any soundproblems with other objects but today when I moved the 20mm flak over the map I didn't hear any sounds of the pak. I hear it firing but all other sounds (in comparison when moving a pak) did not show up. First I thought the sound is not enough loud, but to test it a put it on maximum - and I still couldn't hear any pushing sounds. It is just a bit bizar to move a heavy gun (from the viewpoint of an infantry soldier) when there are no soundeffects. My problem is: The files were deleted and aren't anymore on rapidshare. Can you please upload them? Since the incremental patch I have lag issues and thus like to kill them with the proposed step. I get with the start the message which is mentioned in the FAQ area.